:: Please dont mix UCAN with any other supplement you are currently using. UCANER'S have in the past tried to creare their own 'muti 'mix UCAN special and sorry to say, it doesn't work. Any other supplement that contains simple sugars (glucose, sucros, fructose) or an ingredient called Maltodextrin will make the UCAN ineffective. Also please dont mix with sugar replacement products such as Isomaltose or derivatives thereof. :: Sorry, you also cant drink UCAN at the beginning of your activity and then redose with any other sugar based products, whether that is a bar or other energy drink that contains sugar. Why Not? Well, UCAN provides a duel fuel energy system as a result of the impact it has on your blood glucose levels and insulin. So the minute you get sugar into your system your blood glucose profile changes and your pancreas start's to secrete insulin...insulin will counteract the UCAN SuperStarch ingredient and stop body fat oxidation... and then you are back to square one with spiking nd crashing energy levels. For optimum UCAN results please avoid all other sugar roducts before or during activity. :: If you mix the UCAN with less water then the product will be thicker in texture with a slighly more 'powdery' and sharper taste. If you mix with more water it will result in a more 'runnier' drink with the taste being knocked down a bit. We suggest around 300-350ml of water, chilled. UCAN decide what works best for you! :: Want to plan your redose? 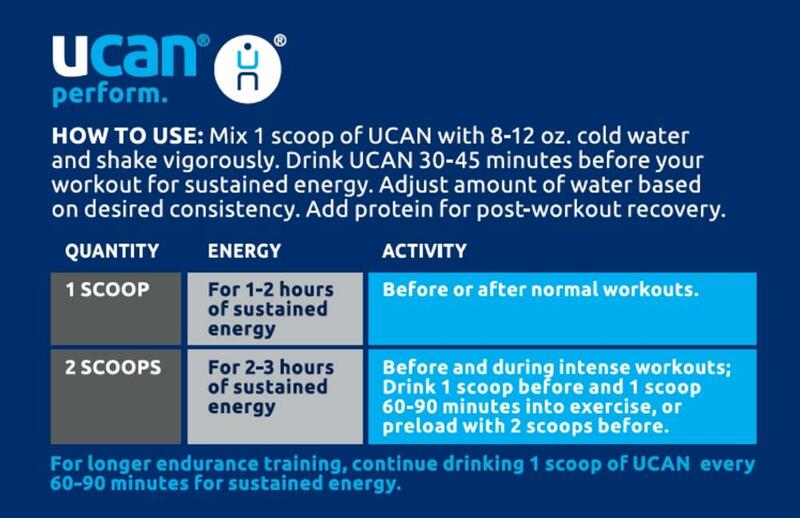 On average, a sachet or 2 scoops of UCAN wll be good for your energy requirements up to 3 - 3.5 hours. We say this on average as we are all slighly different when it comes to metabolic efficiency, fat burning abilities, training and conditionng etc. So if your event is going to be longer than 3 hours we suggest you redose. Unlike sugar, UCAN will take a bit longer to work its way through your system so we suggest you dont take it at the exact time you hit your 'energy wall' If you wait this long you will remain energy low untill the UAN works its way into your system and this could cost you some performance. If you need energy at your 3 hour mark then redose at around 2h30. Experiment and see what works best for you.